The Grange of Beaumont is one of five farms belonging to the old Abbey of Clairvaux founded by Saint Bernard. In the very heart of a beautiful clearing and nestling in a powerful and austere forestry setting, it remains the only original estate of the great Abbey which has retained a landscape inherited from medieval times. The site belonged to the Abbey of Molesne and was inhabited by a few peasants when in 1131 the Abbot of Clairvaux undertook to buy the land and send in a team of lay brothers to cultivate it. A beautiful barn, which still towers over the place with its huge roof of old tiles, was then built, followed by a building for the lay brothers, a dike to close off the local brook and create a pond, then, later, a tile factory was added. Down the centuries, Clairvaux continued to use the land for cereal production, as originally intended. 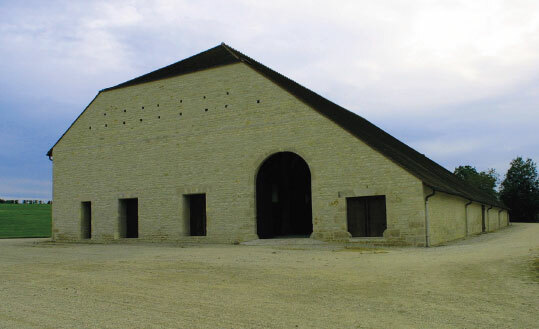 The beautifully renovated Barn shows an impressive roof structure of squared oak, rising to 12 meters at its highest part, covering a surface of 1000square meters spanning 5 naves and 8 bays. It remains the unquestionable testimony to the skill of the carpenters who covered the Cistercian sites with major works of art of medieval architecture.